A total of seven drawer�s worth of storage space! 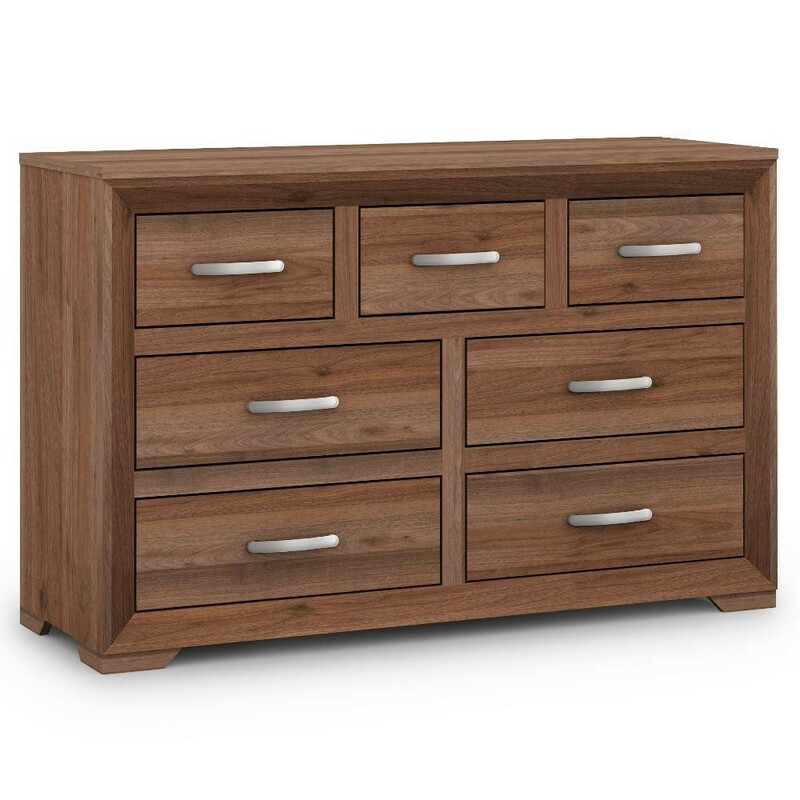 Organise your bedroom with the Buckingham Walnut 7 Drawer Wide Chest. The chest is finished in beautiful walnut, creating a warm and inviting piece that will compliment any bedroom interior. The walnut is perfectly offset by the addition of the chrome handles, each used to access the drawers. There are 7 useable drawers in total, providing plenty of storage space to help keep bedrooms organised. There are 7 useful drawers that help to organise the bedroom. The top layer houses 3 smaller sized drawers, ideal for makeup, beauty essentials, jewellery or intimates. Beneath the top level of drawers are 4 more drawers, 2 on each side of the chest. These drawers provide slightly larger storage for items of clothing or other belongings that need to be stored in the bedroom. The Buckingham Walnut 7 Drawer Wide Chest is ideal for the bedroom, but it could easily be used in other areas of the home. The chest is great for storing clothes but there are other items that can be stored within the drawers, anything from toys to video games. Keep the space organised and try with this beautiful piece of bedroom furniture. Use the chest as a standalone piece or match with other items from the Buckingham collection. The Buckingham Walnut 7 Drawer Wide Chest is constructed from strong and sturdy materials. The walnut effect and inset frame detailing results in a quality finish that is attractive in all settings. The walnut effect finish is continued inside the drawers, adding to the overall elegance and charm of the bedroom furniture. The Buckingham Walnut 7 Drawer Wide Chest works beautifully in traditional homes but is equally happy in modern settings, thanks to the chrome handles and use of straight lines. The product is part of the Buckingham Walnut Wooden Bedroom Furniture Collection.